Home » New York City » Illegal Conversions – What’s the Real Story? Illegal Conversions – What’s the Real Story? an alteration or modification of an existing building to create an additional housing unit without first obtaining approval from the NYC Dept of Buildings. So, if someone takes a 2 bedroom apartment and partitions it into two 1 bedroom apartments without permission, that would be an illegal conversion. Simple enough. Why are illegal conversions a problem? And it seems south Brooklyn is not alone. Since the start of 2010, the City’s 311 complaint hotline has logged a city-wide total of 92,574 illegal conversion complaints, plotted in the map above. Clearly many people view illegal conversions as a major problem. But it was not immediately obvious to me why. So I dug around to see if I could find a good explanation. Below is a rundown of the various reasons I found. Judge for yourself whether any of them make sense to you. I’m not sure what it means for sewer usage to be strained. but at least the part about the inflated property values is plausible. Housing affordability in New York City is strained enough as it is, and higher property values do generally lead to higher property taxes. Now this is getting interesting… Not only is there disagreement about how illegal conversions affect property values, but also about whether it is better for them to go up or down. Just to show that these are not isolated opinions, here is another one blaming illegal conversions for increasing property values, and here is one blaming them for lowering property values. I have the highest respect for New York City’s firefighters, who risk their lives to protect others. So this is not an issue I wish to minimize. But are illegal conversions really putting fire fighters in such serious danger? According to FDNY data, only one firefighter has died in the line of duty in the last three years, and it had nothing to do with an illegal conversion. In fact, I have not managed to identify any case where an illegal conversion in NYC was responsible for a firefighter’s death. 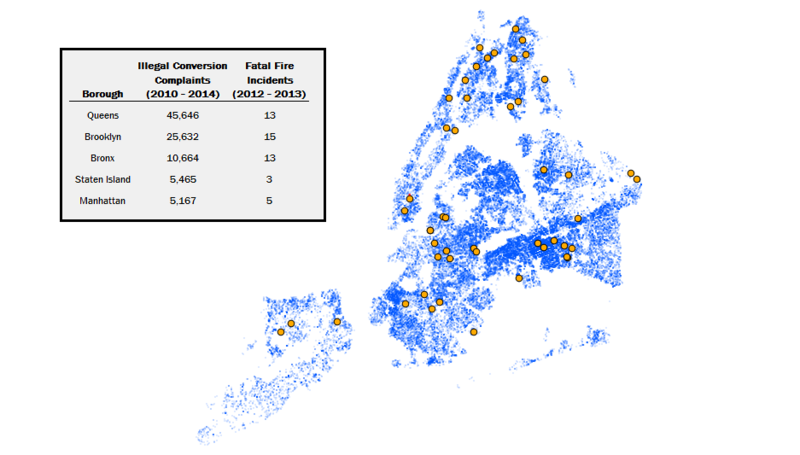 Based on FDNY data for the two year period 2012 to 2013, there were 49 fires that resulted in fatalities. Of these 49 buildings, 19 of them had previously received a complaint for having been illegally converted. In other words, about 40% of fatal building fires occurred in buildings likely to have been illegally converted. Based on these numbers, it is hard to dispute that residents of illegal conversions are at greater risk of being harmed in a building fire. However, it is not the inhabitants of illegal conversions who are complaining, it is their neighbors. Is their opposition really out of concern for the safety of others? More importantly, does a policy of eliminating illegal conversions actually benefit the inhabitants? The Department of Buildings found conditions at 249 Norman Avenue to be “imminently perilous to human life” following an inspection Feb. 10th. The roughly 25 tenants were given a week to collect possessions and now have to find another place to live. Aaron and Jennie Drogoszeski with their miniature daschunds Pita and Clyde. 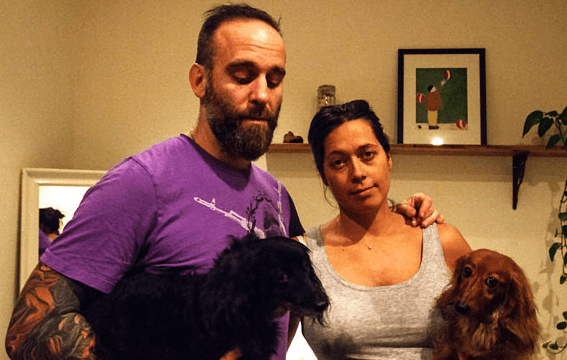 With their first child soon on the way, the couple have been turned out of the Greenpoint apartment they’ve lived in for more than three years. What kind of housing policy throws families out on the street to protect them from fire code violations? New York’s schools are indeed overcrowded, but is that really the issue here? If so, wouldn’t it be more logical to campaign for the City to build more schools? Hire more teachers? Is throwing those children and their families out on the street really the best solution?! One attendee drew a rhetorical line from illegal conversions to an increased presence of massage parlors, sweatshops, signs of human trafficking, and trash. Some hoist those problems on the neighborhood’s growing Asian-American population, and at least one person made a comment briefly bringing such tension to the forefront. “I don’t feel comfortable with an Asian in the room, I have to admit,” shouted one attendee from the crowd. Are these the people our elected officials are pandering to? Redlining – the practice of, in the United States, denying, or charging more for, services such as banking, insurance, access to health care, or even supermarkets, or denying jobs to residents in particular, often racially determined, areas. De facto racial segregation – during the 1950s and 1960s was simply discrimination that was not segregation by law (de jure). I think Councilman Menchaca and his fellow elected officials owe us a better explanation. Next Article Why is the Rent in NYC so High? This was a very in depth article. It states excellent facts regarding the ongoing situation of illegal dwellings here in this very ridiculous expensive city. I have lived in an illegal apartment in Brooklyn and the owner broke down walls separating two apartments and combined them into a single unit with several rooms. In other words, he transformed the entire floor into a rooming house. The FDNY came after a complaint was made about lack of a safe exit from one of the rooms. Dept. 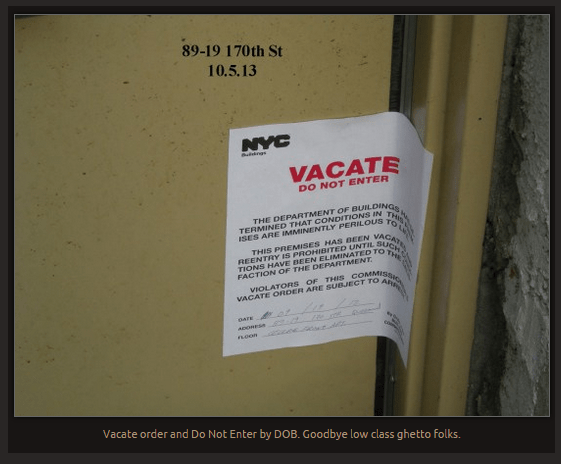 of Buildings was notified and you know the rest…..not a happy ending for the tenants. Yes, when a Vacate Order has been issued, people are sadly put out on the streets! I called an architect and the buildings department and am trying to fix this the right way. It will probably cost me $40,000. If I am required to do things that are ridiculously priced, I will clear the violation eventually……change the house back to a two family and pay less taxes. Less income for the City! Yes people do things illegally and with ill intentions but in this case it wasn’t. I am being terrorized by the Department of Buildings and who cares….probably no one. I will try my best to fix things the right way but, if forced to I will just clear the violation and lower my taxes forever! By the way, again it depends on each individual situation. I’m not referring to the ridiculous subdivisions but, in honest circumstances if the city was reasonable more people would file to correct various situations. Then more income would be generated for the city. It’s all about the money and giving fines and screwing honest as well as the others……so wouldn’t this make sense?